Description: Parish of St. Anns, from Tottenham Court Road and Soho Square south to Leicester Square. From Stow's seminal Survey of London, illustrated by John Strype. Coloured. 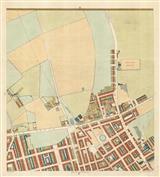 Description: Clerkenwell, including Sadler's Wells. Published in the first illustrated edition of John Stow's Survey of London. Coloured. 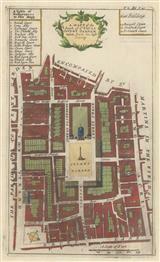 Description: Covent Garden, centring on the Piazza oriented northeast as north and detailing the area between Long Acre, Drury Lane and The Strand. Published in the first edition of Stow's seminal "Survey of London". Coloured. Description: Tottenham Court Road. Coloured. Description: Plan and profile of Tottenham Court Road, with inset map of the area from the British Museum and Bedford Square to Oxford Street. Coloured. 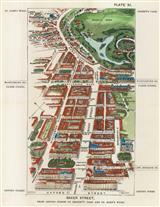 Description: Plan and profile of Oxford Street, with inset map of the area from Leicester Square to Tottenham Court Road. Coloured. Description: London. Shows Westminster from St. James's Park to the Thames. Coloured. 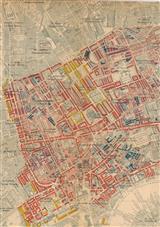 Description: Map detailing from Oxford Street to Regent's Park and St. John's Wood. Coloured. Description: North and North East London. From King's Cross, Angel, Bloomsbury and Clerkenwell east towards Bethnal Green, Hackney, Whitechapel and the London Docks. Printed Colour. Description: Unusual piece of cartographic ephemera showing the planned route of Queen Victoria's Jubilee Procession on June 22nd 1897. Printed colour. SL. Description: West End and Holborn. Sectional map describing London poverty derived from Booth's seminal survey. Inset key. Original colour. Description: Vintage plan of the West and the City of London with an emphasis on the Mayfair area, from St. Paul's to St. James's. Printed colour.